Take your embroidery to the next level with the exciting Innov-ís NQ1400E embroidery-only machine from the Q-Series lineup. Now you can embellish everything from home décor to clothing with one of the 138 built-in embroidery designs and a variety of lettering fonts. You'll be sure to love the design editing features that give you the ability to resize, rotate, reposition and combine designs with ease. 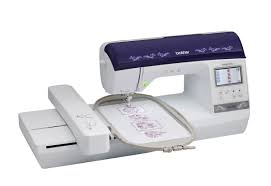 With many great features and included accessories, get ready to embroider all your projects on the large 6" x 10" embroidery field with the Innov-ís NQ1400E. Large embroidery area: maximum embroidery field of 6" x 10". Includes one embroidery frame: 6" x 10". Built-in embroidery designs and lettering fonts: 138 built-in embroidery designs, 140 frame pattern combinations and 11 embroidery lettering fonts. 8.3" from needle to arm: more room to the right of the needle to easily maneuver your embroidery projects. Generous workspace: features a 59% larger workspace than previous models. 3.7" Colour LCD touch screen display: use the super bright, vivid colour touch screen display to manage all your embroidery functions. Stitches per minute: embroider designs at up to 850 stitches per minute. Create more works of art in less time. Design editing features: includes letter editing, enhanced zoom, resizing, rotating, repositioning and combining designs.